I would explain or show a few photos I had on my iPad. But I know that these responses weren’t as good as demo-ing. So why wasn’t I doing demos? Because I’ve not painted well in a public setting – nerves! But at my last 4-day show, I finally decided to paint on the spot as a more tangible way to answer the question. 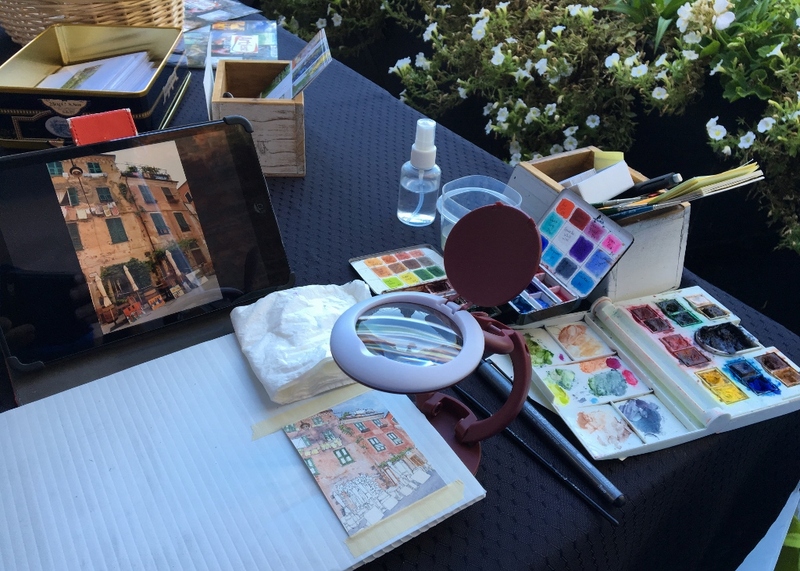 I sourced a small magnifier with light, and packed up my usual travel kit tools – mini pallettes, plasticore board with attached drawing, a few go-to brushes, paper towel and small water containers. I perched myself on a foldable stool at the end of my small display table, and started painting Mini Vacations piece #50. And all that fear and trepidation melted away! (You knew that, right?) I didn’t get very far on the painting because I was having so many wonderful conversations with people and this put me at ease. It struck me how curious people were about this process, the tools, the time. At one point someone asked if they could do a short video interview with me about how these pieces get made! Acch!! You’d think as a former Theatre grad, I’d be ready for my close up!! No! I painted every day of the show, and posed for many photos, and it was lots of fun! I finished up piece #50 in the studio this week after taking some time off painting to draw for a week. So 2 milestones achieved – half-way to making 100 pieces, and getting over my fear of public painting! 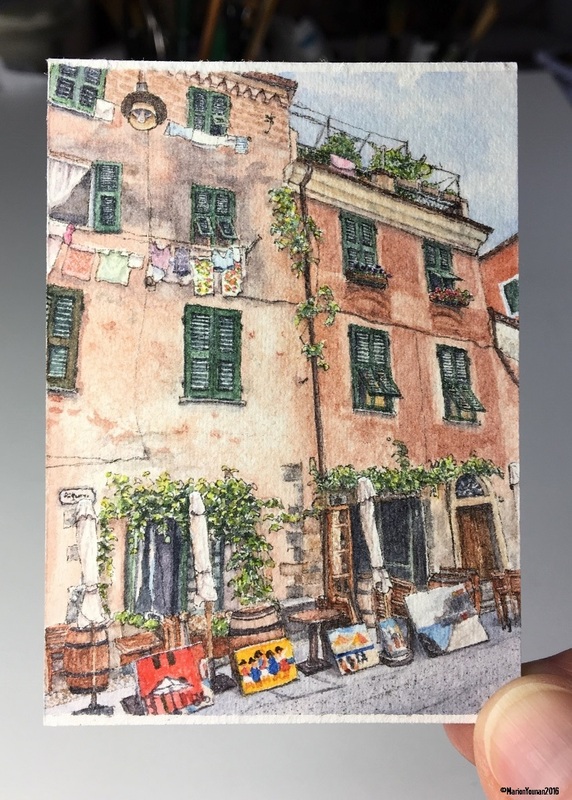 Quickly, the story behind this piece – in 2006, I travelled solo for the first time (another milestone) to the Cinque Terre where I joined a hiking group. 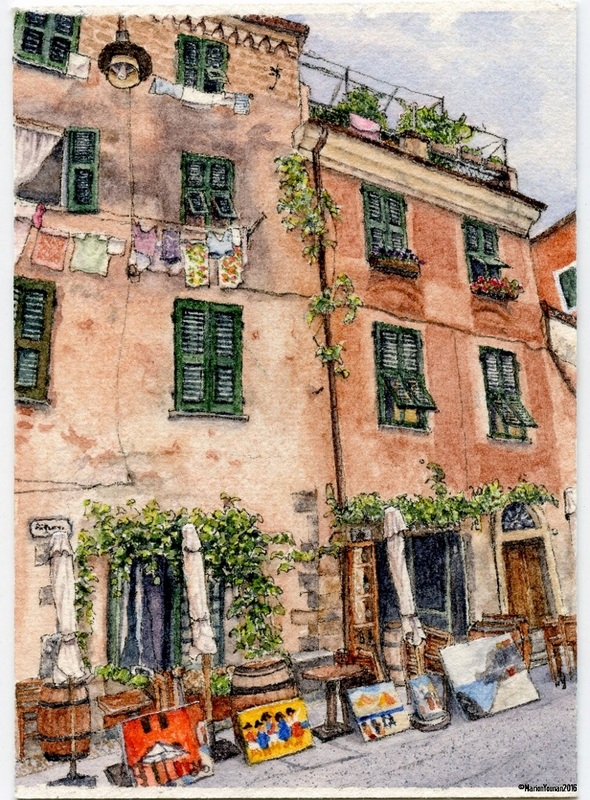 After a long day of hiking, we’d clean up and meet at this enoteca (wine bar, and obvious patron of the arts) in Monterosso al Mare for some wine, laughter, and getting to know one another. I looked forward to 5:00 every day! Cin-Cin! Ashley, glad you liked it!